The goal of this article is to assist you in purchasing a dive computer. Whether it’s your first dive computer watch you’re buying or your fifth, buying a dive computer is a tricky ordeal. There’s scores of features to consider and many makes and models of varying reliability. On top of this, you’re essentially trusting these devices with your life – you don’t want to make the wrong decision. 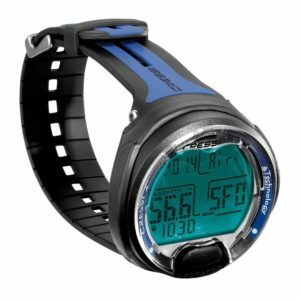 Below I’ve listed my own dive computer reviews, which include dive computer watches as well as console models. 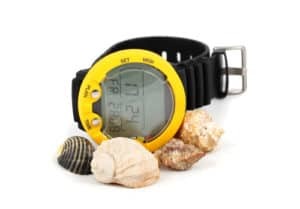 These reviews will assist you in choosing from among the best rated dive watches. But first for people who are unfamiliar with these devices, what is a dive computer? These days, the word “computer” means the device on which you’re currently reading this article: a sophisticated combination of processing units, memory, and display monitors. However, when dive computers first came on the scene (in the 1980s), they were named “computers” because they literally computed how far and how fast you could dive without becoming afflicted with decompression sickness. They weren’t very sophisticated, more akin to calculators than to modern day computers. Current dive computers have all sorts of features and capabilities that set them apart from the primitive machines divers used in the 1980s. But their primary function remains the same. You use them while diving so that you can dive down to a safe depth and know when you should begin to ascend to the surface. They make all the relevant calculations based on your dive-depth, duration, and gas mixture. When you’re approaching an unsafe amount of time at a particular depth, the computer will trigger alarm to alert you to return to the surface. Before there were dive computers, divers of all types relied on analog dive tables – literally a laminated plastic card that showed how long you could stay at different depths. Divers today still use these – they’re an incredibly useful backup to keep with you while diving, in case your dive computer isn’t working – but they’re tricky to use, requiring some calculations and mental math on your end. Using a dive table introduces the possibility of human error, which is effectively eliminated when using a dive computer correctly. Why should you use a dive watch? Let’s imagine for a moment what it was like to dive without a dive computer – which is what all divers did before the 1980s. You’re relying entirely on a dive chart to tell you how long you’re able to stay at the respective depth at which you’re diving. The chart is big, with many variables, and it’s all pretty confusing. Moreover, you might have trouble reading it in the depths, if you wanted to consult it on a dive. If you don’t understand the dive table all the way, you might be tempted to come up well before you have to – wasting precious bottom time in the process. Alternatively, relying solely on a dive computer might lead you to lose track of time and stay down too long. This could lead to decompression sickness, which obviously is no fun at all. All this could be prevented by using a dive computer. One of these devices will stay with you for the duration of your dive and make all the relevant calculations based on your depth and duration. When you’ve reached the time at which you should head back to the surface, your dive computer’s alarm will go off, audibly alerting you. Even if you’re old school and like to rely on your trusty old dive table, having a dive computer accompanying you on your dive is a good, sensible way to supplement your setup. These devices have a host of accompanying features, like built in compases and air integration monitors. Perhaps the most compelling argument for using a dive computer: They’ll give you more bottom time on your dive. There’s just no way to measure depth and make mental calculations to the degree of accuracy that a computer can. The dive computer will make more precise calculations than you can, which means you’ll have a better idea of how long you can stay down at depth. Modern day dive watches are safe, reliable, and reasonably priced. They’re relatively easy to use, so you won’t have to spend too much time fussing with a dive table – meaning you’ll have more time to enjoy your dive. Dive computers legitimately can save your life. 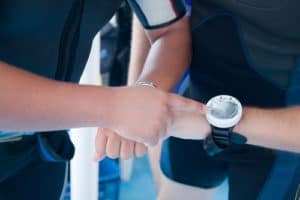 Why shouldn’t you use a dive watch? That’s the real question. Dive computers can be split into three major categories. Each have their respective pros and cons. Choosing one over the other will primarily depend on your budget and how often you dive. As the name implies, these types of computers come in the form of a watch: they hang from the top of your wrist secured with a strap. 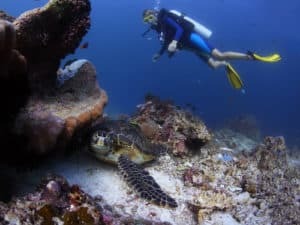 They’re the cheapest form of dive computers, although some of the more advanced models can become quite expensive. Watches are also the simplest to use; they have minimal buttons, and you don’t have to set them up much before using them. Because of their price and ease of use, they’re ideal for beginners. In fact, if you’re buying a dive computer for the first time, I would suggest purchasing no model except for a watch. There’s no reason to buy an expensive, tricky-to-use console model when you might not stick with diving long term. Unlike wrist mounted computers, console models attaches to your BDC or somewhere else on your scuba setup. When you need to check your console computer, you need to grab it and orient it so you can see the screen. That’s primarily what sets them apart from dive watches. Some people will argue that it’s easier and more intuitive to check your wrist for dive information, rather than grabbing a separate device. Other people don’t like how small the displays are on watches, preferring the bigger displays of consoles instead. Aside from aesthetic concerns, there tend to be more consoles models that have the ability to integrate with your breathing system. 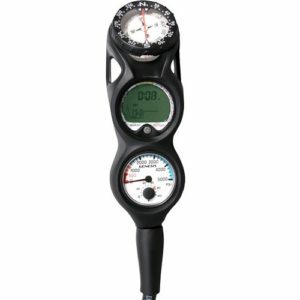 This increases the price of the dive computer considerably, but gives you the benefit of no longer needing a separate air pressure gauge. Some computers will even calculate the amount of air time you have left, based on your depth and exertion levels. This is cutting edge technology. These masks seem more out of a video game or science fiction movie than from reality. The dive computer on these models works similarly to others, but its display is the revolutionary thing. The information from the computer is projected onto the lens of your mask. So instead of looking down to check your watch or console, it’s right there in your field of vision. There are numerous advantages to this set up. Number one, it makes it harder to forget about the information your dive computer is relaying to you, since it’s right there on your mask. And number two, you don’t have to divert your gaze from whatever is in front of you whenever you check your computer – which is especially nice for example if you’re filming anything with a GoPro. Note: the prices listed below are retail prices. You may find better – or worse – deals elsewhere. This is one of the best beginner dive computers on the market. It’s especially notable for having only one button. You won’t be easily confused using this. Another solid option for beginners. Some people will be put off by how big it is. They weren’t lying when they named it – it feels like having a hockey puck on the back of your wrist. However, for all the myopic divers out there, or for those who frequently dive in cloudy waters, the large screen will be most welcome. This is a more advanced version of the Mares Puck. It has the added features of more memory, the ability to specify three different gas mixtures on a single dive, and generally more customizability. Another notable feature is its wide screen, which makes it even easier to read than the Puck model. All in all, a solid beginner watch. 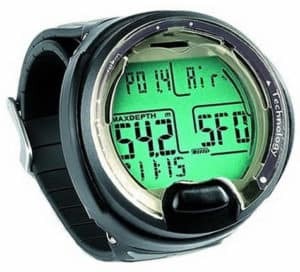 This was one of the most popular dive computers on the market for many years. 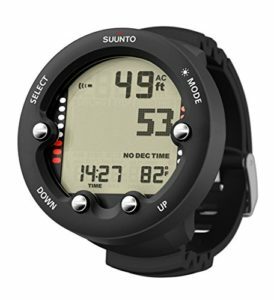 Now it has been somewhat superseded by other models, including others made by Suunto. However, it is still a great choice for someone purchasing their first dive computer, since it can be found for a reasonable price. The updated version of the Zoop, slightly more expensive but also substantially better. It has more buttons than the regular Zoop, which makes it slightly more complicated to operate. But it makes up for it by offering a free diving mode, in case you free dive in between scuba sessions. And it has the ability to upload its data to a computer through USB – so you can preserve data for each of your dives for all posterity. 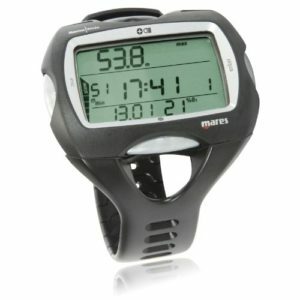 This model is a great choice for this price point of dive computer watches. It has more features and customizability than some of the cheaper models, while still being easy to use for beginners. The Newton sets itself apart by being attractive from a design perspective. It’s smaller than many of the wrist mounted computers out there, and with a look that’s more sports watch-like – and less like calculator with a strap. 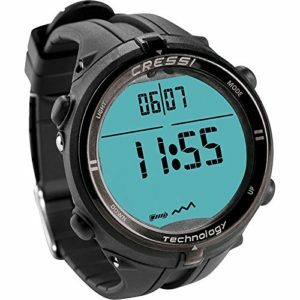 With this in mind, Cressi gave the Newton a “watch mode”, so you can wear it won’t wear out the battery when wearing it while not diving. Now we’re getting to the good stuff… The Galileo is one of the best dive computers on the market right now. Period. 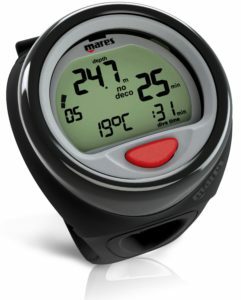 Unlike most other dive computer watches, it’s air-integrated, and its air integration is done wirelessly. Meaning, you don’t need any extra tubes on your setup. 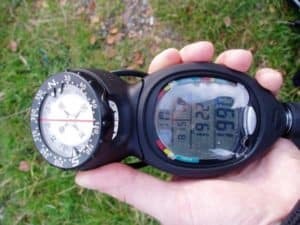 The air integration also means you can calculate how much air time you have on the same display as your dive computer. Simplicity is a beautiful thing. The downside to all this quality is that you have to pay for what you get. Four figures is a pretty steep price, so if you’re a beginner, you should probably invest that amount of cash in another part of your setup. 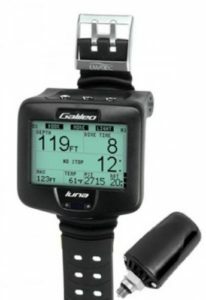 But if you’re an expert looking to get the best piece of equipment available to you, it would be hard to do better than the Galileo Luna. The Genesis Resource Pro one of the best console dive computers for beginners. 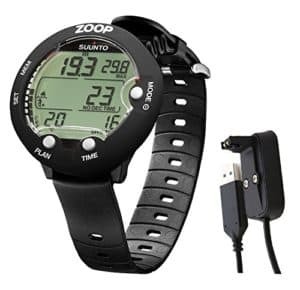 It’s fairly easy to program and use, and it can be found for a price cheaper than many dive computer watches on the market. But it also offers the benefit of air integration. If you’re a diving beginner who likes console dive computers, look no further than this model. 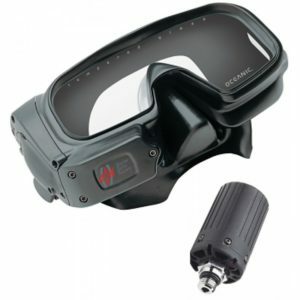 And if you’re a more advanced diver who’s looking for a cheaper air integrated device, this is a good option. The Suunto Cobra 3 is the de facto choice for upper end console dive computers. A really cool thing the Cobra offers that other dive computers lack is a simulation mode. Using this feature, you can virtually game-out your dives, so see how much bottom time you might have on a particular dive. Pretty cool! Other than that, there’s not really much else to say. If other computers can do it, the Suunto Cobra 3 can do it too. By buying the Oceanic Data Mask, you’re buying the diving equivalent of a flying car or the self-lacing shoe from Back to the Future. It’s something so futuristic seeming that it’s hard to believe they actually exist – and actually work! 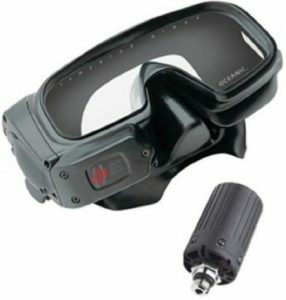 The display from your dive computer is projected onto your mask. That means you won’t need to look down at your watch or console. You’re able to adjust the backlighting on the mask display, so you’re still able to see the read out in dark waters or make it lighter so it doesn’t distract from your dive. Are Data Masks reliable? Well they’re used by military divers, and if the military trusts them, you can probably trust them to hold up on your recreational dive.